Build sandwiches. Open and lay out the bread. For each sandwich, spread 1 tbsp. ranch on bottom slice of bread. Fold 6 slices turkey breast and place on bottom slice of bread. Next place 2 slices turkey bacon on top of turkey. Top meat with ¼ c. green leaf lettuce and 2-3 tomato slices. Finish with a second slice of bread. Hold at 41°F until serving. Cut in half to serve. Ranch dressing, low fat 1 qt. 2 qt. All Natural Oven Roasted Sliced Turkey Breast, #2318-18, thawed 9 lbs. 6 oz. 18 lbs. 12 oz. 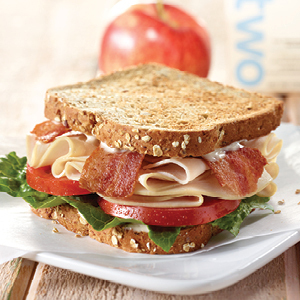 Premium PERFECT SLICE™ Fully Cooked Crispy Turkey Bacon, #2711-06, thawed 1 lb. 2 oz. 2 lbs. 4 oz. Green leaf lettuce, washed, RTU 2 lbs. 4 lbs.